Bifunctional oxygen electrocatalysts of perovskite nickelates RNiO3 can be tuned by changing rare-earth elements. Using a set of well-defined, epitaxial RNiO3 (R = La, La0.5Nd0.5, Nd, Nd0.5Sm0.5, Sm, and Gd) thin films, researchers proved that decreasing the ionic radius of R is beneficial for OER but not for ORR, revealing that a strategic tradeoff can be designed to balance their performance. Enlarge Image. In the search for highly active and inexpensive electrocatalysts, two reactions pose a particular challenge: the oxygen reduction reaction (ORR) and the oxygen evolution reaction (OER). Both are important for the development of better fuel cells, metal-air batteries, and electrolytic water-splitting. Materials such as platinum, iridium oxide and ruthenium oxide are well suited for these reactions, but they are scarce and expensive. Led by PNNL scientist Yingge Du, a team of researchers is evaluating alternatives. 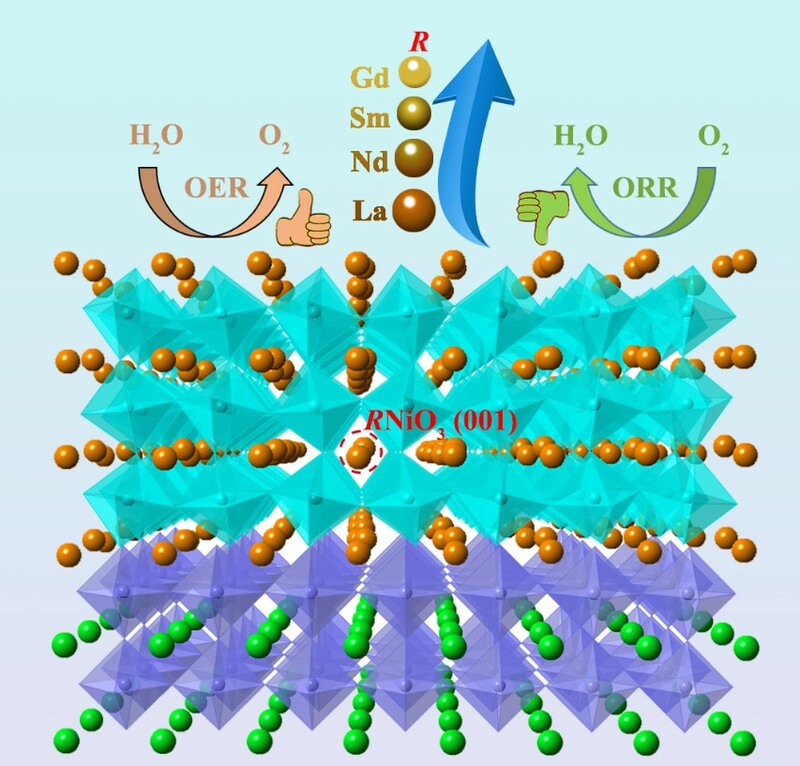 They’re working together to study perovskite-structured rare-earth nickelates (RNiO3) that can serve as bifunctional catalysts capable of performing both OER and ORR. Recently, Du and his team conducted performance-testing on a set of well-defined RNiO3 epitaxial thin films and discovered which properties contribute to higher electrocatalytic activity. By tuning the rare earth elements (R), scientists correlated the structural and physical properties of various nickelates with their ORR and OER activities. “We found that tuning the rare earth elements is an effective strategy for balancing ORR and OER activities of bifunctional electrocatalysts,” remarked Du. Their study, “Tuning Bifunctional Oxygen Electrocatalysts by Changing A-site Rare-Earth Element in Perovskite Nickelates was recently published in Advanced Functional Materials. Why it matters: Designing high-performance bifunctional electrocatalysts requires strategically balancing OER and ORR. By examining these activities in the closely related RNiO3 family, scientists can establish structure-property-performance relationships—an area that has not yet been systematically explored. These fundamental insights can be used to design better, lower-cost catalysts to perform these critical oxygen reactions. Summary: Du and his research team investigated a series of rare-earth nickelate thin films grown on SrTiO3(001) by pulsed laser deposition, where R variations include lanthanum (La), neodymium (Nd), samarium (Sm), and gadolinium (Gd). It was found that decreasing the ionic radius of R (rLa > rNd > rSm > rGd) would lead to a decrease in the electronic conductivity of the resulting films, which impacts the ORR in a negative way. On the other hand, the OER activity initially increased upon substituting La with smaller ions, such as Nd or mixtures of Nd and Sm. Reducing the radius of R was shown to increase the average occupancy of the antibonding eg orbital through the formation of oxygen vacancies, a condition known to enhance the OER activity. The work shows that even though the OER and ORR cannot be enhanced simultaneously in RNiO3, the future design of such bifunctional electrocatalysts should benefit from strategic trade-offs, especially considering the slow kinetics of the OER is the main cause of energy loss for many low-temperature energy storage devices. What's next? The researchers are continuing to investigate the impact of strain and doping on the physical, chemical, and ion-transport properties of RNiO3. Acknowledgments: This work addresses two Basic Research Needs for Synthesis Science Priority Research Directions for Basic Energy Sciences: (1) Basic Research Needs for Synthesis Science for Energy Relevant Technology, Priority Research Direction 2 (Accelerate materials discovery by exploiting complex chemistries and molecules, and interfacial systems); and (2) Basic Research Needs for Catalysis Science to Transform Energy Technologies, Priority Research Direction 4 (Design catalysts for efficient electron-driven chemical transformations). Sponsors: This work is supported by the U.S. Department of Energy (DOE), Office of Science, Early Career Research Program under Award No. 68278. The XRD reciprocal space maps measurements are supported by U.S. DOE, Office of Basic Energy Sciences, the Division of Materials Sciences and Engineering under Award #10122. J. Wang acknowledges financial support from Ministry of Education, Singapore under the Grant No. MOE2014-T2-1-099. H. Guo is supported by the National Natural Science Foundation of China (Grant No. 11574365). Electrochemical measurements were supported for K.A.S. by the Linus Pauling Distinguished Post-doctoral Fellowship at Pacific Northwest National Laboratory (PNNL LDRD 69319). User Facilities: A portion of the work was performed at the W. R. Wiley Environmental Molecular Sciences Laboratory (EMSL), a DOE User Facility sponsored by the Office of Biological and Environmental Research. Research Team: Le Wang, Kelsey A. Stoerzinger, Mark E. Bowden, Zhenzhong Yang, Scott A. Chambers, and Yingge Du (Pacific Northwest National Laboratory); Lei Chang, Lu You, and Junling Wang (Nanyang Technological University); Jiali Zhao, Jiaou Wang, and Kurash Ibrahim (Chinese Academy of Sciences); Yangyang Li, Rui Guo, Jingsheng Chen, Chi Sin Tang, Xinmao Yin, and Andrivo Rusydi (National University of Singapore); Haizhong Guo (Zhengzhou University). Reference: L. Wang, K. A. Stoerzinger, L. Chang, J. Zhao, Y. Li, C. S. Tang, X. Yin, M. E. Bowden, Z. Yang, H. Guo, L. You, R. Guo, J. Wang, K. Ibrahim, J. Chen, A. Rusydi, J. Wang, S. A. Chambers, Y. Du, 2018, "Tuning Bifunctional Oxygen Electrocatalysts by Changing A-site Rare-Earth Element in Perovskite Nickelates," Advanced Functional Materials 103, 1803712, doi.org/10.1002/adfm.201803712.